The Boot, Warton – Rock Nite! A top Tamworth rock band got a taste of charity concerts when they staged a show at Polesworth Comprehensive School in aid of the national Kidney Machine Week. Sky Cycle – a four-man outfit who write all their own material – and lower sixth form pupils at the school organised the gig. A TOP Tamworth rock band are out to expel the myth that the town is falling behind in all aspects of the music world. Sky Cycle claim that there are few musical facilities in Tamworth and are now busy promoting their latest venture – a rock night at Warton’s Boot Inn. Bass player Peter Noel Ghent, who lives in the village, says that Tamworth is really behind in the rock scene and he hopes that their regular venues could encourage other groups to set up music evenings. “By doing this the town’s young people will have somewhere to go at nights and entertainments that they enjoy,” he says. Formed two years ago Sky Cycle write all their own material – to date consisting of 20 numbers which they intend to use to full capacity at their Boot Inn venues. Three new members have recently joined the line-up and are busy learning the ropes before they begin to play live. For the sake of Tamworth’s musical talents I hope that Sky Cycle’s rock nights encourage other local bands to follow suit. There are the facilities in the town yet the only other group to take the plunge is Brewster who play regularly at the Chequers, Hopwas. Some years ago there was a hive of musical talent in Tamworth but now all our talent seems to be hidden away and our groups playing in other towns. There was also a time when Tamworth got the top groups – remember the Beatles and the Rolling Stones at the Assembly Rooms or Black Sabbath at the town’s college? Those days might have gone but I still feel Tamworth could once again become a centre for striving young bands. Who knows, in a few years we could be producing the superstars normally associated with larger towns and cities. 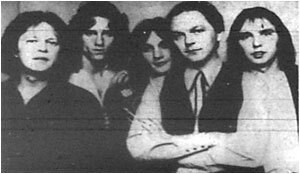 The full profile and history of Sky Cycle has yet to be added to TamworthBands.com Call back soon to read the full band details.